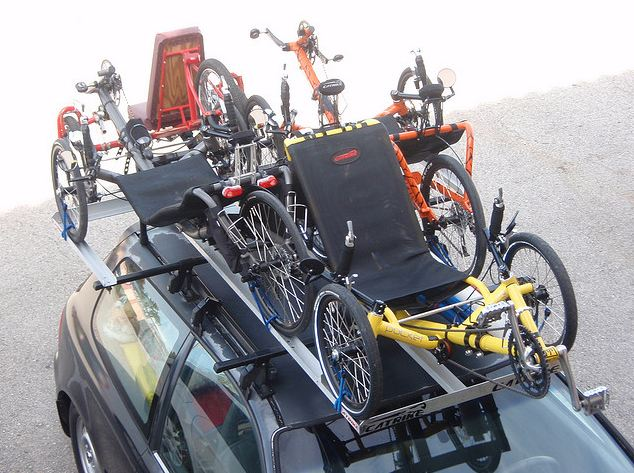 There are 3 of us with recumbent Terra trikes and need to purchase a trailer or rack to hold them. There are a lot of different trails in Florida and we want to ride them. The trikes don't fold. So how can we do it without taking 2 or 3 cars. My first thought was just to pile them all onto a roof rack. Even with a smallish car you should be able to get a platform rack that will take two trikes, one facing forward and one backward. Then stack the third (smallest) trike on top of the rear-facing trike. That will likely put the highest point of the trike more than a metre above the roof of the car, but that should be fine. I would run a strap from the trikes to the front bumper of the car, partly for security but also to remind you that they're there. There are a lot of stories of cyclists driving into garages with bikes on the roof (the bikes are often destroyed). I searched online for "recumbent trike car carrier". 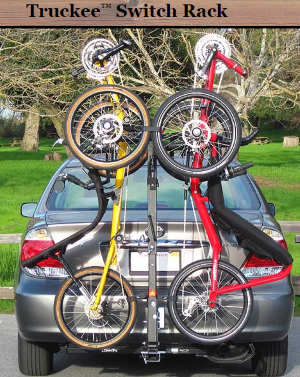 There's at least one company making a hitch rack that will take two trikes, the "Truckee". Add a roof rack and you should easily fit three trikes on even a smallish car. A lot depends on how strong you are, as trikes are not particularly light and those carriers require you to life the trike some distance onto the car. With a roof rack you can (carefully) roll the trike up over the windscreen. If you have a station wagon with split rear seats you can very likely fit a trike in there with the rear wheel poking through one of the folded down seats, but you'll probably have to pull the "bottom bracket" out of the trike to close the rear door, which is a bit of a hassle (but since that's where you adjust the trike for size, it's something that's designed to be easy-ish to do). If the car is slightly larger you can probably stack two trikes then roll them into the car this way. With something like a Suburb you could probably remove the rear row of seats and stack three trikes across the back on their sides. Not the answer you're looking for? Browse other questions tagged trailer recumbent or ask your own question.